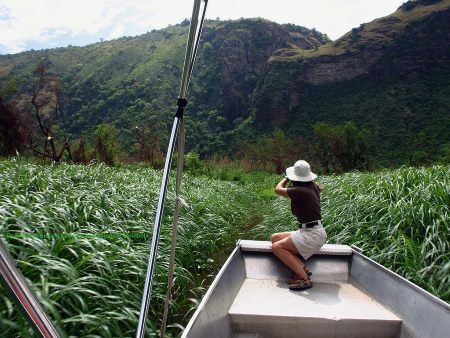 Once referred to as the “Pearl of the British Empire in East Africa”, visiting Uganda, being one of the most beautiful countries on the African continent is like visiting the Garden of Eden. Uganda is a land of contrasts. In half a day you can drive from mist –shrouded volcanic mountains to hot, hazy savannah dappled with wildlife. Serene undulating lush hills of tea plantations give way to tangled jungle and rainforest with the musical accompaniment of chaotic, cacophonous birdlife. Uganda is alive with these contrasts: The tiniest sunbirds, iridescent in the morning light, the massive lumbering yet silent elephant, the chimpanzees crashing about the forest canopy, the majestic gorilla, chewing thoughtfully in the bamboo thicket. This is Africa the way it should be! Here are sample itineraries that include Uganda. Ugandas biggest tourist draw are of course the mountain gorillas with almost half of the world’s population located in one of East Africa’s most famous national parks, the World Heritage listed Bwindi Impenetrable National Park. There is nothing in comparison to the thrill to observing these magnificent, peacefull apes in their native environment. But they aren’t the country’s only great apes. Humankind’s closest relative, the chimpanzee, is found in several of areas of Uganda. Parks with varied wild life covering different habitats, few tourists and friendly people make for a memorable experience well worth visiting. And as Uganda combines both Central African forests and East African savannahs , it is home to more than half of all Africa’s species of birds! High season is June – September and December to February. It’s hard to predict nowadays when the rainy season will be. Climate changes are making it difficult to forecast. Normally the long rainy season should be in March, April and beginning of May and short rainy season in November. However, the last 5 years the short rainy season has been in early December. Gorilla tracking can be done throughout the year and success rate of seeing them is the same . In rainy season the tracks in the rain forest might be a bit muddier and your tracking might be a bit longer and tougher because of that. However, it’s a rain forest, so the difference is not all that big compared to dry season, especially in November. In rainy season you are more likely to track in smaller groups. Uganda provides permits at a discount of US$250 per day so this is an incentive for picking the rainy season, especially November. Please check with us prior planning your trip as this can change. Within Uganda, Gorilla trekking is conducted in Bwindi National Park or in Mgahinga National Park. But because of the inconsistency of gorillas in Mgahinga, the majority of the sold permits are for Bwindi NP. In Uganda, every gorilla permit goes for US$600. Although April, May and November is rainy season with more challenging, muddy conditions, the permit fee is the same. 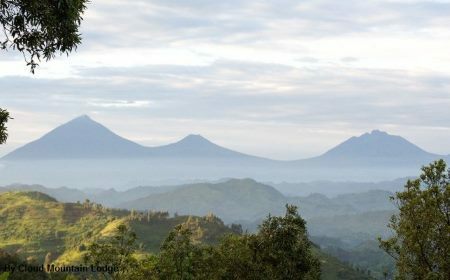 On a single day, nearly 72 people travel into Bwindi to see gorillas and only 8 people are allowed per gorilla family. Permits are sold first come, first served by the park service. If you are planning to visit in high season of June to September or December to February we encourage advance notice to secure your preferred date. In Uganda you may state your preference which group you would like to visit but consideration also has to be given to the location of your accommodation. Ease of getting to the Parks: Unless you are planning a whole country Uganda Tour your travel from Entebbe would be a short but costly morning plane flight plus two hours by road, or about 8-9 hours road travel to Bwindi versus 2-3 hour road travel from Kigali. Ease of getting to the gorillas: Uganda sells permits for a particular gorilla group which you can request when booking well in advance. Although keep in mind that the location of your accommodation influences which groups you can see as the driving distance is 2-5 hours between starting points. In Rwanda which group you will see is decided upon on the day by the guides as all groups start out from the same starting point. This allows for assignment of less athletic and older people to gorilla groups that are closer to the starting point. Hence, less fit people might consider this advantage. Also people that like to take longer hikes can state their preference. In Uganda your permit is for a particular group and that’s where you will go, regardless of their location that day. Cost: Permit trekking prices are US$1,500pp for Rwanda and US$600 for Ugand. Uganda visa (also valid for Kenya and Rwanda) for Americans is US$100, Rwanda visa is US$30. Ease of sighting: Although foliage depends on where the gorillas are located at time of visit, in general the foliage is thicker with bigger leafs in Uganda with Rwanda having more bamboo forests which have smaller leafs. Cultural considerations: A visit to a Batwa pygmy village in Uganda can easily be incorporated when visiting Bwindi from the south western area. In Rwanda you may visit a living cultural museum. Gorillas and Chimpanzees: Possibility of seeing gorillas as well as chimpanzees is currently easier accomplished in Uganda than in Rwanda, although one of the operators is developing an option in Rwanda which will be available in the future. Serengeti and gorillas:If you are also visiting the Serengeti, than Rwanda is the easier choice in regards to flight connections due to direct flights from the Serengeti to Kigali. Kibale is the most popular place to view chimps. 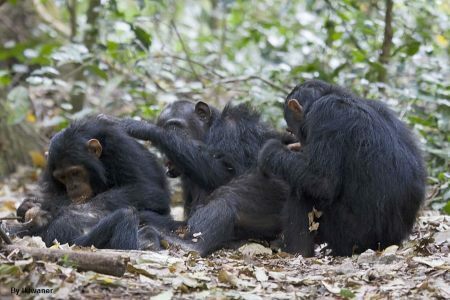 Some of these groups have been habituated to human contact in the same way as the gorillas, and although their more energetic lifestyle and unpredictable nature makes them slightly less approachable, there’s no doubt that hanging out with chimps is one of life’s great experiences. In addition to escorted walks, the park also offers a Chimpanzee Experience Program which starts at 6am for you to see them leave their nests and it continues to before dark. 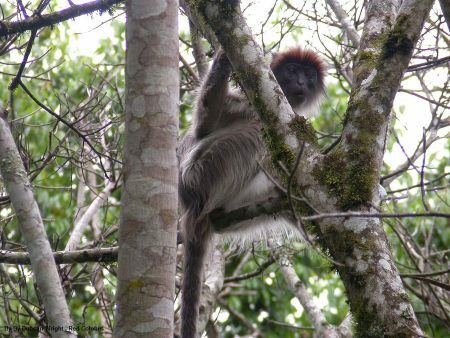 Besides chimps, other opportunities are to see are black and white colobus monkeys, red colobus, gray-cheeked mangabey and red tailed monkeys. 300 species of birds have been listed, yet birding can be challenging in this environment and a local guide is crucial. The gold-tinted savannah grasslands and tangled forests of Queen Elizabeth National Park are the best areas to view big game in Uganda. 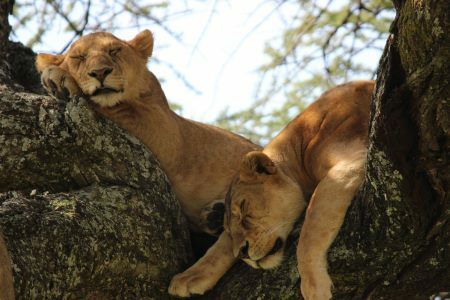 The area is also known for their tree-climbing lions in the Ishasha region and the hundreds of hippos that wallow in the waters of the Kazinga Channel. Other inhabitants include leopard, buffalo, sitatunga antelope, Uganda kob and topi. You will not find rhino, zebra, impala and giraffe! With 547 bird species it is one of the highest amount of species in a protected area in the world. You can also find the rare and prehistoric looking shoebill stork along Lake George and the Ishasha region. The scenery includes swamps, rivers, volcanic craters and crater lakes, tropical forests and lakes. Not so well known is the park’s population of chimps, who frolic about the 100m-deep Kyambura Gorge. Although the chimps are habituated to humans, there’s no guarantee they’ll show up for the party. However, when they do, the low number of visitors means you’ll probably have them much to yourself. 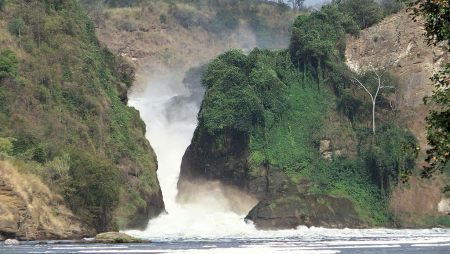 Murchison Falls Conservation Area comprises of Murchison Falls National Park, Bugungu and Karuma Falls Wildlife Reserves. This is where the Nile explodes through a narrow 20 foot wide gorge and cascades down 150 feet to become a placid river whose banks are thronged with hippos and huge concentration of crocodiles, waterbucks and buffaloes. The vegetation is characterized by savannah, riverine forest and woodland. Wildlife includes lions, leopards, elephants, giraffes, hartebeests, oribis, Uganda kobs, chimpanzees, and many bird species. Presently the highlite of a visit to Murchison is the boat trip up the stream to observe the Falls and riverbank wildlife taking about 3 hours return. The Nile below Murchison Falls offers exciting challenges to anglers with a chance to land a huge Nile Perch (the record is 238 pounds). Fishing is limited to designated sites and places are limited so advance booking is recommended. Over 400 species of birds will delight any twitcher. The Budongo Forest Reserve, up in the northwest of Uganda, is often overlooked by tourists, yet its dark and dense forests are considered one of the better places to play “I spy” with chimps. Two to four hour chimp-tracking trips (you only get one hour in their company) run daily and, as at Kibale, between October and June, two visitors a day are allowed to spend the entire day with them. Snug against the Congolese border, the diverse Toro-Semliki Wildlife Reserve offers quieter and less certain chimp encounters than nearby Kibale. However, the lighter forest cover means that sightings tend to be clearer and the chimps here also frequently venture out into open savannah, where they are more likely to walk upright. If you’re lucky enough to witness this then you’ll really feel as if you’re watching animal evolving into man. Finding the right clothes for your gorilla trek is not hard, but important. Remember this is Africa and the mountain gorillas live in Bwindi Forest , where the weather is very unpredictable! It rains every now and then and generally has a wet jungle climate. So you can imagine the steep and often slippery hills… you get the idea! Are Mountain Gorillas a Dangerous Species? Will they hurt me during the trek? When mountain gorillas are threatened they do attack so as to protect their very own. You will be advised on proper behavior around them to avoid this situation. When different Mountain Gorilla groups meet, there is a fight between the leaders and can lead to death. Recently two Silverbacks fought within the Democratic Republic of Congo and the rangers had to intervene.